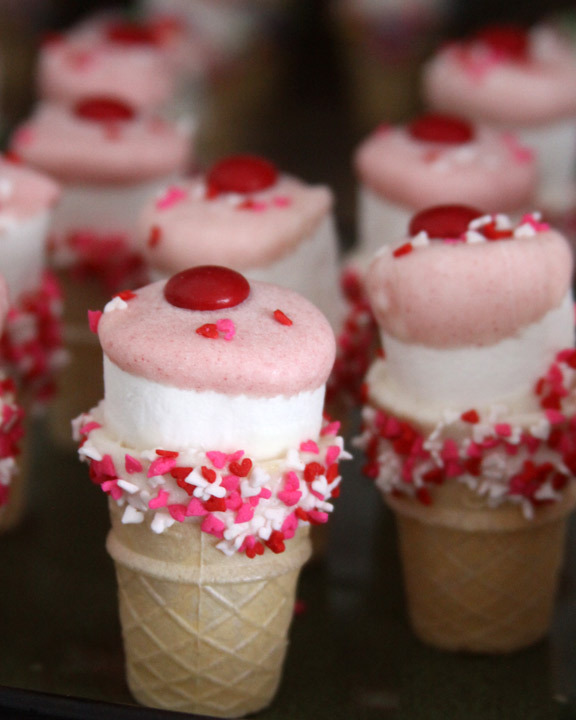 Need a treat that’s fun and easy? 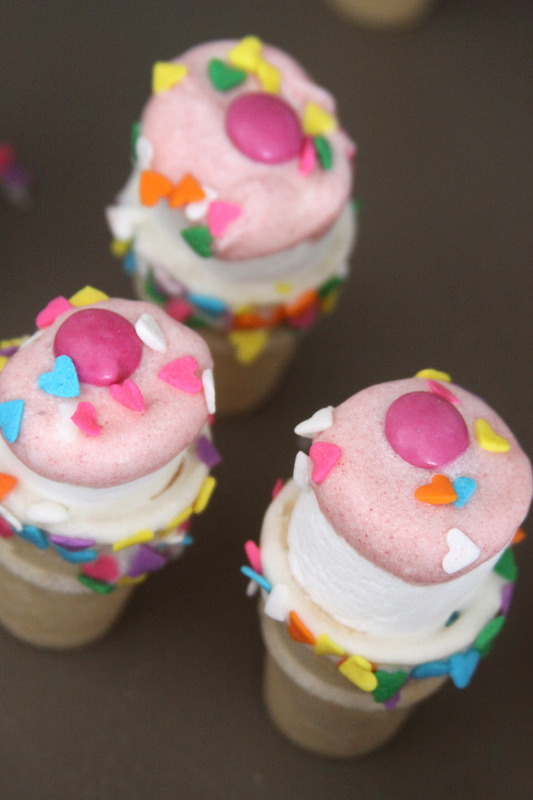 These little ice cream cone marshmallow treats are simple to make and so much fun for kids of all ages. They are great for parties, school snacks, holidays, or just for fun to get your kids in the kitchen with you. 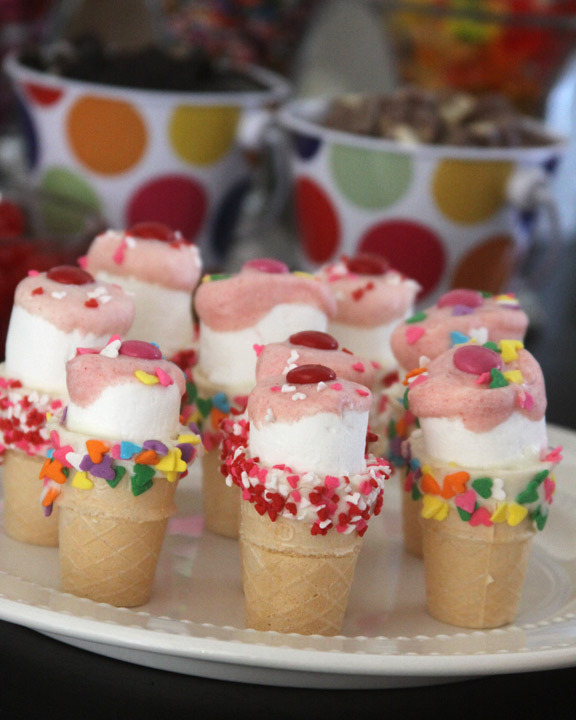 Sprinkles and food coloring can make these non-ice cream ice cream treats fit any party theme. I came up with these little treats for my daughter’s 3rd birthday celebration. We had an ice cream bar, and an all around ice cream themed birthday party and these were the perfect addition. She can’t get enough marshmallows so I wanted to make a treat that fit the theme and that I knew she would love. I was inspired by some little Meringue cone treats, and another idea for marshmallow treat pops. I put the two ideas together and mixed them up a little to create the perfect lil ice cream cone treats. These were unbelievably easy to make and turned out so cute. My daughter helped me every step of the way, and was overjoyed when she got to hold and eat the finished product. These can be customized for any event with coordinating sprinkles and food coloring! Before you begin making these make sure you have everything laid out on the table and the packages all opened up. Put some sprinkles in a small shallow bowl. Once you melt the chocolate you have to work fast before it cools and hardens. First put half of the bag of white chocolate chips into a glass bowl. Melt it in the microwave. I heat it for 30 seconds stop and stir, and repeat until the chocolate is all melted. Next dip a cone straight down into the melted chocolate. The chocolate on the outside of the cone s to adhere the sprinkles and the chocolate on the inside of the cone is to attach the marshmallow into the cone. Roll the outside of the cone through the sprinkles being careful not to get them on the inside of the cone. 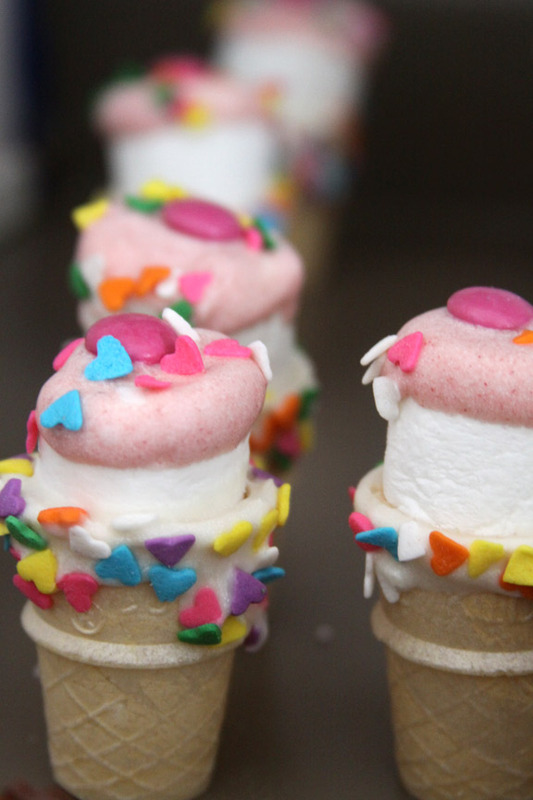 Now take one marshmallow and push it into the cone. It should be the perfect size to push easily into the cone. Repeat this process with the rest of the cones. Now melt the other half of you white chocolate chips int the same manner as before, only add food coloring to this batch if you wish. I think this would look adorable with milk chocolate chips too. Now add the M&M “cherries to the top and finish with sprinkles. –My little girl loved watching these all come together, and she thoroughly enjoyed choosing the sprinkles and M&M toppings for each cone. 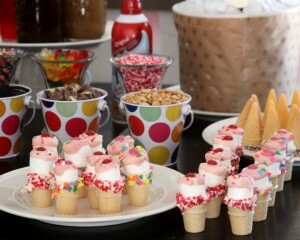 These were so cute added to the ice cream bar, and were the first thing each and every kiddo reached for on party day. I was able to make these about 4 days before the party and store them in an airtight container. I t was nice to have them all pre-made and packaged up so on party day all I had to do was put them out on the table. I even had enough left over to send some to school with my son for a treat to share with his friends.